Caring for curly lace front wigs oughtn't be complex, but it ought to be consistent as curly hair wigs have proclivity for frizz; it's just a fact and part of how you care for curly hair wigs should be geared to ensuring that the curls are defined, smooth and well... orderly. The key areas in looking after your curly textured human hair (whether lace wig or traditional monofilament cap wig) relate to combing, daily styling, washing and nourishing (which includes using hair oils, conditioning and moisturizing). There is always an element of curls unravelling from their neat locks and this happens regardless of curl size; to prevent unwanted or unmanageable frizz (yes that's right, some folks like undefined curls and that's OK - we don't judge) always, always, always use a wide tooth comb (like a shower comb) and never use a brush of any kind. It's better to do the combing when the hair is wet as combing curly hair when it's dry is a straight route from unravelling-curl-town direct too frizzville (vis-à-vis what started as a few unravelled curls soon becomes frizz). Use a wide tooth comb and start combing at the ends of the hair, working towards the lace wig cap. Avoid pulling or tugging the hair as this causes shedding and distortion of the curly texture. Don’t over comb the hair as it can contribute to shedding of hair or distortion of curly hair texture! Ah, to heat style or not to heat style, that is the question and the answer is that it is nobler to not heat style. There is no easy way of saying this, so we'll just say it. Heat styling tools should be a no-no for curly hair wigs and curly hair extensions... there, we've said it. Soz but it's true. This isn't to say that you can't heat style a curly human hair wig, just that you run the risk of distorting the curl pattern and damaging the hair if you heat style on a regular basis. Curly textured hair has (for the most part) been chemically processed (permed) to produce the curly texture which means the hair structure has been weakened (if you don't believe us, check out this article http://www.yalescientific.org/2010/04/everyday-qa-how-does-a-perm-work/) which is why frequent heat styling can lead to curl distortion. Moisturize daily with moisturizing sprays that are mineral oil free or oil free altogether (a light misting is fine). Check out this moisturizer article for quick DIY moisturizer tips and why glycerine is great). 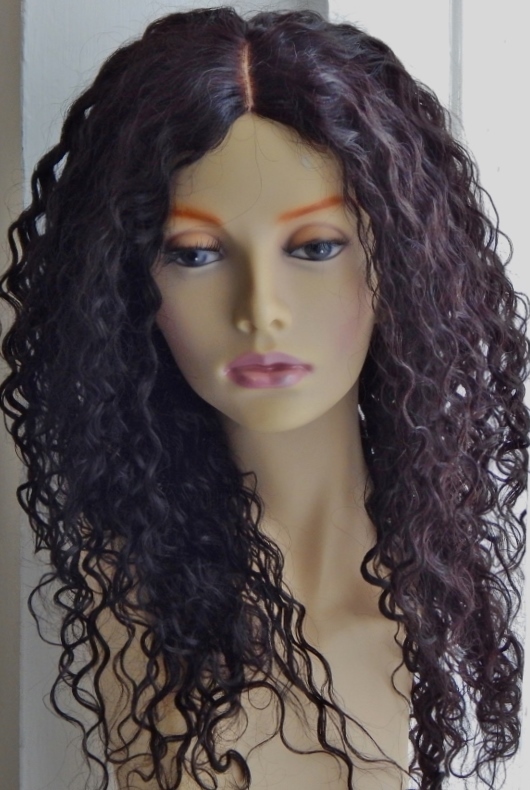 The best washing techniques for curly hair wigs is the upright washing method as this allows complete control of the direction of the hair and prevents tangling. Before washing your curly lace wig, always detangle with fingers first and then use a wide tooth comb working your way towards the roots (lace wig cap). Conditioning the hair will help replace lost proteins and strengthen the hair and there's a guide with steps to follow to condition wigs (lace wigs and traditional cap wigs). Va Bene! That the care guide for curly lace wigs completed!